I just absolutely LOVE this series! It just keeps getting better and better. I get so nervous reading sequels because I am always afraid I won't like it as much as the first. Shade was really good and a definite page turner, but I found the direction Jeri took the story in Shift was just PERFECT in every way. Some parts were predictable and some just left me with my mouth hanging open LOL. In Shift, Aura grows a lot more and knows exactly what she wants. Her character really moves forward and becomes a lot stronger. She discovers who her heart really wants and exactly why her and Zachary are so important, and why they must keep their abilities a secret. Shift lacks absolutely nothing. 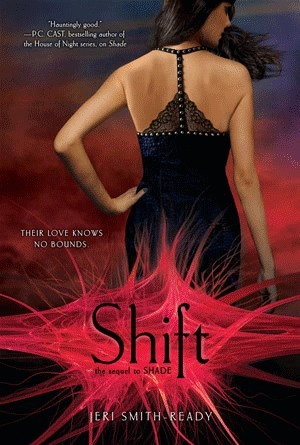 If you loved Shade, then just wait until you read Shift. It brought a smile to my face, tears to my eyes, and "Oh My God" all out of me in one sitting. I was at the edge of my seat waiting to see how everything would play out and how it would end. The ending was perfect, and now to wait for book three just makes me so sad. Jeri Smith Ready delivered an amazing sequel. Loved it! Oh, good! I loved Shade and had high hopes that series would continue to be excellent. Thanks for your recommendation! Yay! I'm so happy it lived up to Shade, because I loved that book! Shift looks amazing and it's definitely on my wishlist. Thanks for the review. It was so good! Lol def. Get it! WOw!! I am so jealous.lol Great Review, I can't wait to read it. How did you get a copy, just curious. Omigosh I am dying to read this one!! SO jealous!!! I can't wait to read this!!! I felt the same way! This was a really good book and I can't wait until Shine comes out.